Michael Hobbiss celebrates his innings of 195 for Burghley Park against Great Houghton. Michael Hobbiss topped the Peterborough Telegraph honours board this week with a brilliant 195 for Burghley Park in a Hunts Division One win over Houghton & Wyton. Opener Hobbiss batted throughout Burghley’s innings of 300-3 until his his dismissal from the final ball. 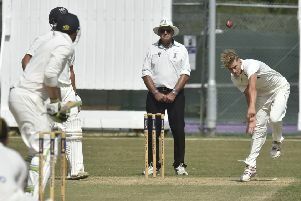 Hobbiss also took five wickets in the match. Zeeshan Manzoor smashed 128 not out for Ketton Sports at Wigston. Sam Tyler claimed his third century in successive games for CAMRA to set-up a 108-run friendly win over Orton Park. Tyler scored an unbeaten 102 in CAMRA’s 241-4 to follow back-to-back knocks of 105 not out and 135 not out. Newborough Bulls are back in the Cambs League after sealing the Hunts Division One crown with an 82-run win over Ramsey seconds at Cricketfield Lane. Newborough, who will play in the new Cambs Division Three next season, successfully defended 152 thanks to fine bowling from seamers Joe Mills, Ashley Fisher and Vamshi Parvathaneni who claimed all 10 wickets between them. 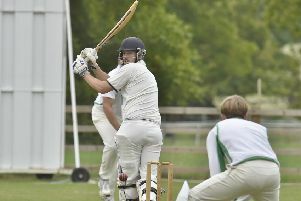 Peterborough Town thirds finished their Division Three season with a 90-run win at Hampton seconds. Star man was Sufyaan Iqbal (6-18). Zeeshan Manzoor (128no) and Ashley Rodgers (103) cracked centuries as Ketton Sports clinched the Leicestershire Division Four East title with a crushing 180-run win at Wigston. Ketton have won 17 of 18 completed matches. First-team regular Ryan Evans did his best to give Castor seconds a chance of the Rutland Division Four East title with a terrific all-round display against Peterborough Town seconds. Evans struck 73 of Castor’s 211-7 and then claimed 5-28 as Town were dismissed for 167 despite 78 from Danny Iqbal. Table-topping Castor have completed their fixtures, but can still be caught by Moulton Harrox who play at Town this Sunday.